iPluggers has a large database of new high-quality releases available for airplay. Their platform uses mail updates (‘iPlugging’) to keep music directors updated on the newest releases in their playlist genre. Stations can also browse the archives for previously plugged releases. The niche tagging of tracks (approx. 200 subgenres) makes finding the perfect track for your playlist a breeze! Tracks are provided as mp3 (320 kbps) with id3-tags and an optional .zip label copy. 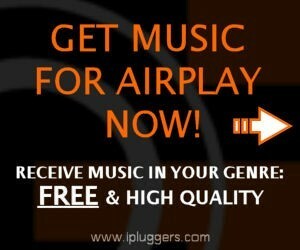 iPluggers is completely free of charge for radio stations. They provide you with the newest releases in various genres. They only provide tracks of top artists! Artists and labels are carefully selected using a strict A&R procedure. You don’t receive all music, just the genres you’re interested in. When artists and labels have activated ‘interview requests’ you can request an interview once you have downloaded their release for airplay. iPluggers will never sent .mp3 files to your inbox. You only receive light-weight mail updates with links to online press kits where you can listen to- and download the tracks you want to airplay. No special software needed: listen to tracks using your browser and download the newest releases. Download songs in broadcast quality. Browse their archives of releases by main genre and 200 subgenres. You can further personalize your plugging settings and change the plugging genre range and update frequency to suit your needs.